If a man says he is not afraid of dying, he is either lying or is a Gurkha." “The girl cried for help, saying ´You are a soldier, please save a sister´,” Shrestha recalled. Unfortunately for this gang, the soldier was a Gurkha. A bit of background here. Back when the British Empire was at its greatest, they were busy in Afghanistan trying to bring peace and civilization, and build colonies to enhance the empire. While fighting in that region, they reached a portion of the area now known as Nepal, and unlike the rest of the area were not able to defeat these stalwart soldiers. The British knew a good thing when they saw it, and instead made friends with the locals, who called themselves Gorkha after the Hindu guru Gorakhnath. Eventually the British were allowed to hire mercenaries from the protectorate, and these men became known as Gurkhas. Gurkhas rapidly became legendary for two things. The first is their bent machete-like blade called a Kukri, the other is their incredible discipline and fighting ability. 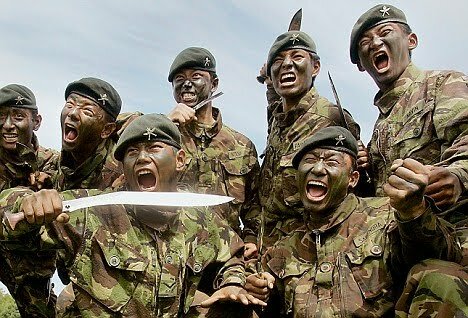 Gurkhas were an elite force which the British knew they could always rely on to fight hard, terrify their enemies, and fight to the last man. "Bravest of the brave, most generous of the generous, never had country more faithful friends than you," they were described for their amazing fighting spirit and their intense loyalty. In this case, the retired Gurkha's loyalty became attached to the girl, and he thought of her as his sister. This was the worst mistake the gang ever made, and the last for several. Srestha reached for his Kukri and when he was done, eight were wounded, three dead, and the remaining dozens were running for their lives. One man against forty; they should have brought more against a Gurkha. The thing is, we don't know what was going through his head before the fight, but it probably was something like this: "I want to get involved, but if I do, people are going to die, and I don't want to kill anyone." When the girl was threatened near him, he had to act. He claims they ran away after twenty minutes because he thinks they figured his buddies were around too. Just picture the scene as a soldier returns from hunting an arch-enemy. Commanding officer: 'Did you get him?' Soldier: 'Yes, sir.' Commanding officer: 'Are you sure?' Soldier: 'Yes, sir.' Soldier reaches into rucksack and places severed head on table. Commanding officer: ' ****!' If it happened in a Hollywood movie, the audience would either laugh or applaud. But there was no laughter the other day when this happened for real in Babaji, Afghanistan, current posting for the 1st Battalion, Royal Gurkha Rifles. The precise circumstances will not be determined until an official report has been completed, but reliable military sources have confirmed that a Gurkha patrol was sent out with orders to track down a Taliban warlord described as a 'high-value target'. Having identified their target, a fierce battle ensued during which the warlord was killed. To prove that they had got their man, the Gurkhas attempted to remove the body for identification. Further enemy fire necessitated a fast exit minus corpse. So, an unnamed soldier drew his kukri - the standard-issue Gurkha knife - removed the man's head and legged it. Look if you don't want the job done this way, don't send a Gurkha. Squeamish British command and civilian government types disciplined the Gurkha for doing his job. ...the almost assuredly apocryphal story about Ghurkas undergoing airborne training. When told that they would be jumping from 1,500 feet, they asked if they could jump from 500 feet instead. The officer explained that they could not, because the parachutes would not have time to fully deploy if they jumped at 500 feet. The Ghurkas basically responded: "Oh, we get parachutes!" and said that 1,500 feet was ok. I read a story of a Gurkha who's arm was wounded during a battle. The British office who was with him was also wounded and either passed out or fell asleep. When he awoke, the Gurkha was holding a pith helmet over the British officers head to shield him from the hot sun while he repeated over and over, "I am a gurka, I will not cry out." The Gurkha's wound was so bad his arm had to be amputated. So that's the kind of men we're talking about. When my dad got out of the Police Academy in 1971, worked for a supervisor who was a Ranger in Korea. His company shared the line with a unit of Ghurkas who would crawl out of their holes at night to kill Chinese troops. On more than one occasion, Rangers in his company would report feeling a hand reach down into their hole and touch their helmet, then move on. The Ghurkas would crawl up to the hole and touch the helmet (or headgear) of the occupant. If they found a Chinese soldier, their throat was cut, if they found an American or other ally, they moved on. I'm planning on spending a few months on a hospital ship that works in ports in West Africa. Things can get pretty sketchy there so I was worried about how secure the ship is. I worried no longer when I was photos of the security force on the ship... Ghurkas. Other commenters became sarcastic, mentioning how in Canada he'd probably be on trial for violating the civil rights of the theives, and how the city of Cambridge has already tried him in absentia. That's the kind of world we live in, though. Those heroic gangsters were redistributing wealth, probably driven to crime by evil capitalist exploiters. They were the real heroes, we'd be told in Berkeley. Though I am from Nepal. I never heard about the incident of train.. I know about the incident and i know about many other incidents that you may never hear. I AM A GURKHA SOLDIER so i have faced it. Thank you CHRISTOPHER TAYLOR for this wonderful and awe-inspiring post. I am a Nepali and know about the incident of the train. The news was all over the papers and TVs a few months back. You are an optimistic person and once again thank you bro for making us proud.